title to 1953: "Salam Affandina"
(Kingdom of Egypt) under the rule of the Pharaohs. c.2686 BC – c.2181 BC Old Kingdom period. c.2055 BC – c.1650 BC Middle Kingdom period. c.1650 BC - c.1550 BC Northern Egypt under Hyksos rule. c.1550 BC – c.1077 BC New Kingdom period. c.1478 BC - 1458 BC Reign of Pharaoh Hatshepsut (f). 1353 BC - 1336 BC Reign of Pharaoh Akhenaten (Amenhotep IV). 1279 BC - 1213 BC Reign of Pharaoh Ramesses II "the Great"
May? 1274 BC Battle of Kadesh between Egypt and Hittite Empire. 744 BC – 656 BC Under Kushite (Nubian) rule. 671 BC - 612 BC Part of Assyrian Empire, ruled by vassal Pharaohs. 526 BC - 404 BC Part of the Persian Empire (as Mudraya satrapy). 404 BC - 343 BC Kingdom of Egypt (restored). 343 BC - 332 BC Part of the Persian Empire. Dec 332 BC - 7 Nov 305 Part of Macedonia (under Alexander "the Great"
7 Nov 305 BC-23 Aug 30 BC (Ptolemaic) Kingdom of Egypt. 55 BC - 32 BC Egypt a vassal kingdom of the Roman Republic. 51 BC – 12 Aug 30 BC Reign of Queen Cleopatra VII Philopator. at the Battle of Actium (Áktion). 23 Aug 30 BC - Oct 270 AD Part of the Roman Empire (as Provincia Aegypti). Oct 270 - 272 Part of the Palmyrene Empire. 272 - 17 Jan 395 Part of the Roman Empire. 619 - 629 Part of the Sasanian Empire (as Agiptus province). 629 - 642 Eastern Roman (Byzantine) rule restored. 12 Dec 639 Arab Muslim invasion begins. Summer 646 Byzantine re-occupation of Alexandria). 8 Nov 1219 - 29 Aug 1221 Damietta occupied by the Latin Crusaders. 6 Jun 1249 - 8 May 1250 Damietta occupied by Latin Crusaders under Louis IX. 2 May 1250 Mameluke Sultanate of Egypt. 9 Oct 1365 - 12 Oct 1365 Alexandria sacked by the Latin Crusaders. 24 Jan 1517 Part of the Ottoman Empire (as Eyalet-i Mısr). Nov 1798 - Sep 1800, Aswan 2 Feb - 26 May 1799). provinces headed by a French military governor. 27 Jul 1801 - 16 Mar 1803 British occupation. 9 Jul 1805 Muhammad `Ali dynasty informally inaugurated. Mackenzie Fraser (b. 1758 - d. 1809). 12 Jun 1821 - 26 Jan 1885 Annexation of The Sudan. 8 Jun 1867 Khedivate of Egypt (under Ottoman suzerainty). 25 Aug 1882 - 26 Jul 1956 United Kingdom (and France) administer Suez Canal. 3 May 1906 Sinai transferred to Egypt by Ottoman Empire. 19 Dec 1914 - 14 Nov 1936 British protectorate. and Sidi Barrani (16 Sep - 11 Dec 1940). 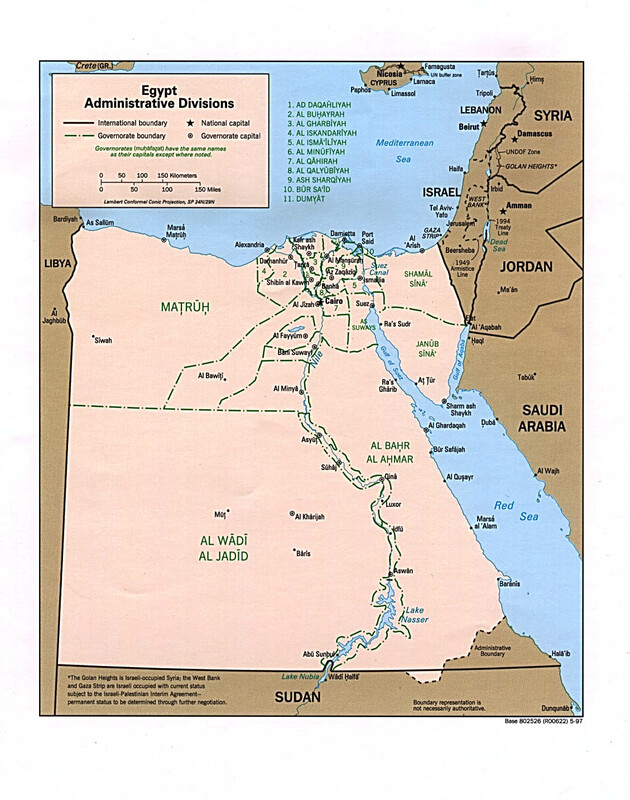 14 May 1948 - 6 Jun 1967 Egyptian administration over the Gaza Strip. 26 Jul 1956 Egypt nationalizes the Suez Canal. 29 Oct 1956 - 7 Nov 1956 Suez Crisis, intervention by U.K, France and Israel. 2 Nov 1956 - 7 Mar 1957 Sinai peninsula and Gaza Strip occupied by Israel. in a lose confederation called United Arab States. 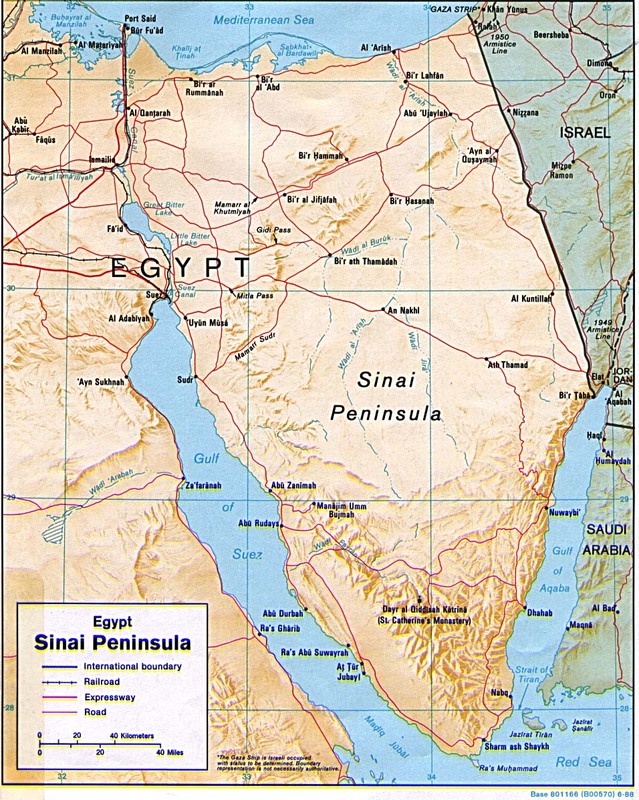 6/12 Jun 1967-25 Apr 1982 Sinai peninsula occupied by Israel. (e) 1899 - 16 Oct 1951: in occasional official (titular to 19 Dec 1914) use with the addition of "Sovereign of Nubia, the Sudan, Kordofan, and Dar Fur." Territorial Disputes: Sudan claims but Egypt de facto administers security and economic development of Halaib region north of the 22nd parallel boundary; Egypt no longer shows its administration of the Bir Tawil trapezoid in Sudan on its maps; Gazan breaches in the security wall with Egypt in Jan 2008 highlight difficulties in monitoring the Sinai border; Saudi Arabia claims Egyptian-administered islands of Tiran and Sanafir, administered by Egypt since 1950, based on 1906 Egyptian-Ottoman border delineation. 30 Nov 1854 Canal construction authorized (by acte de concession). 15 Dec 1858 Compagnie Universelle du Canal Maritime de Suez constituted. 25 Apr 1859 Canal construction begins. 1866, ratified by Ottoman Empire 19 Mar 1866). (172,602 shares out of a total of 400,000 ordinary shares). 25 Aug 1882 British take control of the canal. occupation and not prejudicing sovereign rights of Egypt. 19 Oct 1954 U.K. forces to be withdrawn in stages over 20 months. 24 Mar 1956 U.K. withdrawal completed. 5 Nov 1956 - 22 Dec 1956 French, British and Israeli forces occupy the Suez Canal. 22 Dec 1956 Restored to Egypt. 10 Apr 1957 Canal reopened. 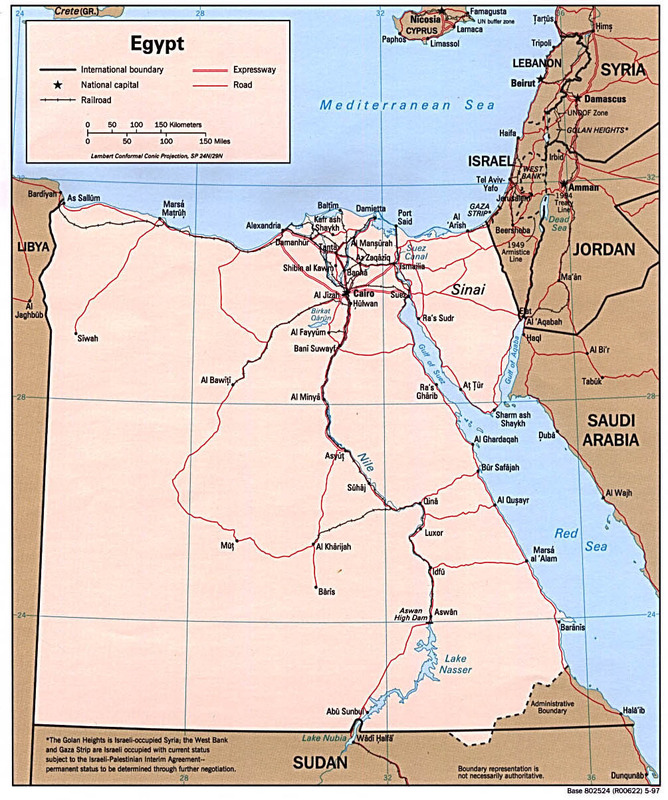 5 Jun 1967 - 5 Jun 1975 Canal closed by Egypt.